I gave myself four creative retreats this past year, of 10 days each. It seems miraculous in retrospect that this was possible. 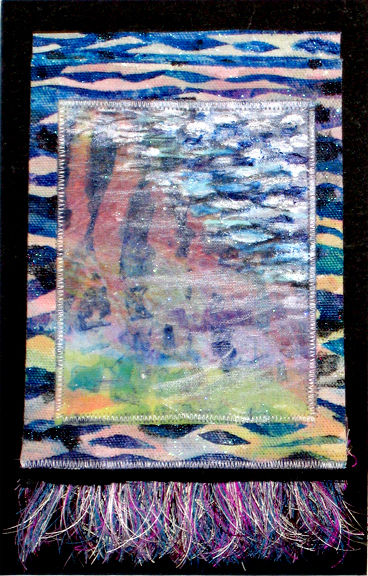 One thing I hoped to work on was a fresh way to integrate painting with the fabric collage process I worked in for 30 years. I've experimented with this plenty of times before. But even though some approaches have been satisfying, a breakthrough had eluded me. The first 3 retreats had been pretty much a flop as far as finding this opening, though none of them felt at all like a waste of time. I wound up with more pictures of water--worshiping the pond that is one of my all-time favorite gurus. And I made the self-portrait eyes that went into the header for my new coaching website at www.selftreasuring.com . (Actually, the first retreat had resulted in the Self Treasuring name, which came about from working on nests--you never really know what you're really making while you're making it, in a way). The final retreat of the year, in late fall, had the earnestness (or recklessness) of endings about it, a now or never feeling. I really wanted to try something different. 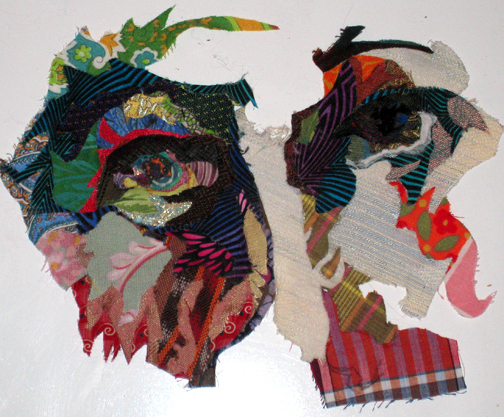 But I found myself digging out something old--a piece I'd started in fabric collage 15 years ago and never finished. It was based on a drawing I'd xeroxed from a book of art created during the Holocaust--I'm still trying to track down the artist's name. 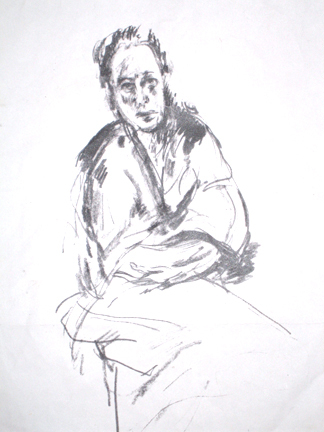 As I went back into the piece, I felt in collaboration with two other artists--the person who'd done the drawing, and the artist I was 15 years ago--along with the energy of the woman portrayed in the sketch. 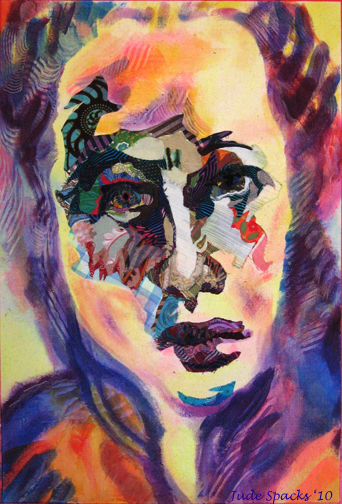 I was being all of them at once as my hands picked up pieces of cloth, the iron, glue, the paintbrush. I heard anxiety in the mix: a WhatWillPeopleThink? voice, worried about making something unpretty, not 'uplifting'--something no one will want to see. I heard a deeper thrum of the fear of the injustice, loss of control and death represented by the Holocaust. I heard the dreaded gremlin MizSpiritual trying to levitate above that fear, sometimes grousing about hadn't we evolved past Hard Stuff pictures? And all the time, that feeling of being carried, of choice-making happening of itself, that no-self experience of giving over into a creative process which feels so profoundly at-home. How should I know what I'm to make? It was being made. There was a fullness of gratitude that can't be expressed. Making light of hard stuff without even trying to. When I could stand back from it and let the finished piece teach me, I witnessed something fiercely beautiful after all. I saw how light just pours out of us, even when we're angry and afraid and hurting, even when terrible things are happening, and we're waiting for something worse. Every moment, everybody is just such a beacon. Even when nothing terrible is happening, sitting in front of a screen, just witnessing and connecting--maybe like you, now. Making light. I don't really make anything--making happens through me--but all I ever want to make is something about that Light. (And that's not MizSpiritual talking, it's just the facts, m'am). 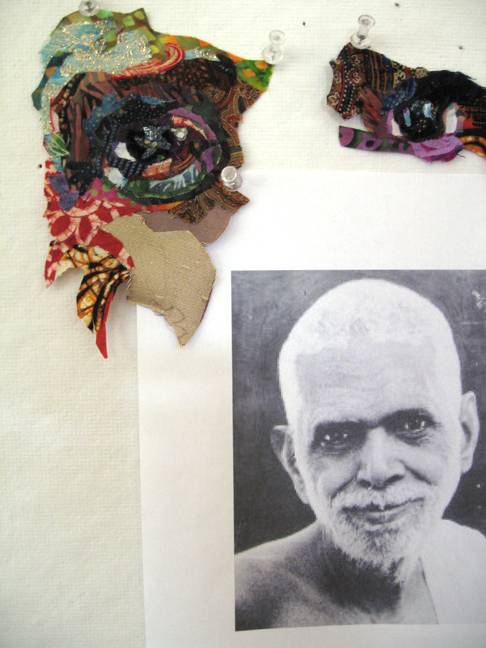 Now that the paint/fabric intersection is happening in a new way, I'm ready to go back into another piece that started during the summer retreat, a portrait of Ramana Maharshi, who radiated the peace behind and around and within every beauty. I'll find a way to open time for this in the winter, when that Stillness is so palpable in the north. This winter, I'll also be leading a coaching group for 9 self-aware women who are ready to meet the creative challenge of their Next Big Thing (even if they don't know what that is yet). Might you join us? Read about the Mystery Mind Creator's Colony here.